Broiling is a healthy cooking method, letting you prepare pork loin without added fat and calories from oil or butter. It's also quick and relatively hand-off, so even novice cooks can pull it off successfully with little opportunity for error. Your most important job is simply making sure you don't overcook the meat, which dries it out and toughens it. Broiling is best suited to naturally tender loin cuts, like pork tenderloin or loin chops. 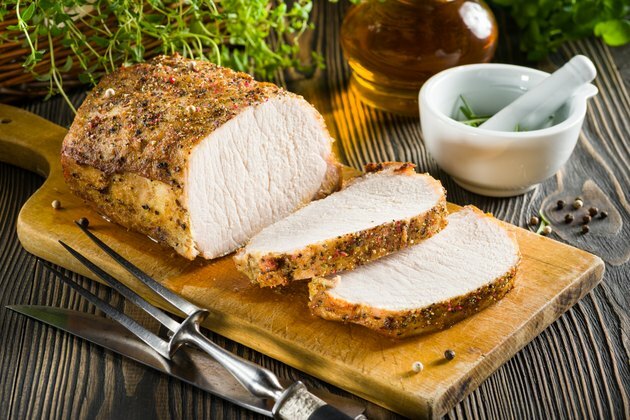 Season the pork tenderloin, loin chops or other pork loin cut to taste with desired herbs, spices and aromatics. Use salt and pepper, along with other ingredients such as thyme, rosemary, tarragon, basil, paprika, minced garlic, garlic and onion powder, allspice, a spicy pepper powder, Cajun seasonings, Italian seasoning, herbs de Provence or a ready-made dry rub. Cover the seasoned pork and refrigerate it for half an hour to 24 hours. Turn on the oven's broiler function and let it preheat for 10 minutes. Grease the top of your broiler tray lightly with nonstick spray or cooking oil. Center the pork loin on the broiler pan. Position thin chops or tenderloin slices around 1 inch thick 4 inches directly below the broiler; position thicker chops or medallions 5 inches beneath it; position whole pork tenderloin or other thicker roast-style cuts 8 inches below the broiler. Broil thin pork loin cuts for approximately 3 minutes per side; cook thicker chops or slices for about 4 to 5 minutes per side; broil whole tenderloin or other roast-style cuts for about 8 to 10 minutes per side. Cook the pork loin to an internal temperature of 145 degrees Fahrenheit. Read the temperature at center with a meat thermometer. Transfer it off the broiler tray right away to prevent overcooking and let the meat rest for at least 3 to 5 minutes before cutting or serving it.